Today was our last day with Frieda Anderson and it was a complete joy. Frieda is a wonderful teacher and quilter and I feel blessed to be able to spend the past three days with her and the wonderful group of women who joined me with Quilting Adventures. Frieda did a wonderful job of explaining and showing us how to start, progress and complete our machine quilting. 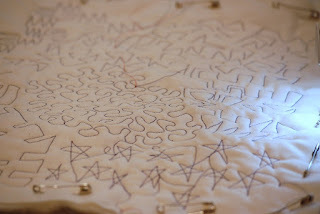 I will admit, machine quilting has not been my area of expertise in the past, but from this day forward, it will improve! It was refreshing to listen and watch and then execute what we were learning today. Heck, I have needles that are self threading in my stash and had no idea what they were or what to use them for! Now I do and they are now my favorite notion! Frieda, thank you, thank you, thank you for the wonderful learning experience and encouragement on stepping out of the box with fusing, quilting and sharing your beautiful hand dyed fabrics. To all my new Quilting Adventure Friends, I hope you all arrived home safely and are ready to practice...practice...practice, and fuse...fuse...fuse. 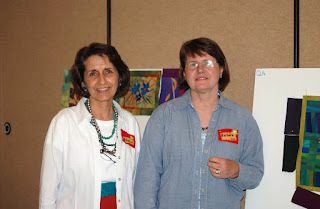 The time we spent together was so enjoyable and I love making new quilting friends! Mona, I hope you feel better! To Barbara and Alice (Quilting Adventures), I will treasure the conversations and the encouragement that each of you shared and gave me. 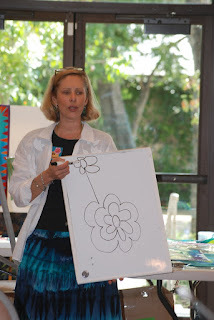 I admire your drive to allow us to learn under the best teachers in the quilting world. I'll be back!!! 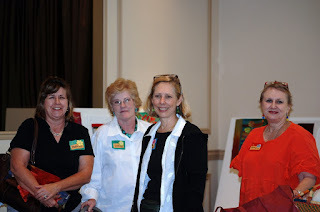 To my blog followers, if you want a great group of ladies to retreat with, Quilting Adventures is the best! I promise, if you go on your own or with a friend, you will go home with a lot of knowledge, fabric and friends! Thanks for the well wishes. I am getting better as the day progresses. Your blogging on the workshop is wonderful.